We recognize as the Sports Then and Now Vintage Athlete of the Month for August one of the key pitchers for the Baltimore Orioles during their championship run of the late 1960s and early 1970s. Sometimes timing is everything. 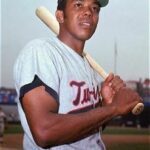 After toiling away in the minors and on primarily losing teams for a decade, a seemingly insignificant trade following the 1968 season proved to be all that Mike Cuellar needed to become one of the top pitchers in baseball. A native of Cuba, Cuellar originally signed with the Cincinnati Reds as a 20-year-old in 1957 after originally drawing attention for a no-hitter he pitched in 1955 while serving in the Cuban army. He made two relief appearances for the Reds in 1959, but quickly returned to the minors and bounced around before finally earning a shot with the St. Louis Cardinals in 1964. Being used primarily in relief, Cuellar pitched in 32 games for the Cardinals and registered a 5-5 record and 4.50 ERA. He did not pitch in the World Series as the Cardinals defeated the New York Yankees. Following the season, Cuellar was sent from the World Champions to the baseball basement as he joined the Houston Astros for their fourth season in the league. During his four seasons in Houston, the Astros never won more than 72 games and finished no better than eighth out of 10 teams in the National League. Cuellar became a starter in 1966 and posted a 12-10 record and a 2.22 ERA. The following season, he made his first All-Star appearance while winning 16 games with a 3.03 ERA. In 1968 Cuellar posted a 2.74 ERA, but won only eight games as the Astros again struggled. After the season, Cuellar was traded to the Baltimore Orioles for outfielder Curt Blefary. It proved to be an amazingly one-sided trade as Blefary spent just one season in Houston and was out of the league by 1972. On the other hand, it was quickly obvious that all Cuellar needed was to be part of a team with enough offense to compliment his assortment of screwballs and changeups. In his first season with the Orioles, Cuellar shared the Cy Young award with Dennis McLain while registering a 23-11 record and 2.38 ERA. The Orioles lost the World Series to the New York Mets, but Cuellar earned the only Baltimore win in the series and had a 1.12 ERA in 16 innings. The following season, Cuellar went 24-8 with a 3.48 ERA and finished fourth in the Cy Young voting. He was the winning pitcher of the World Series-clinching fifth game as he allowed three runs in earning a complete game victory. Cuellar teamed with Jim Palmer and Dave McNally to give the Orioles one of the most dominant starting pitching threesomes in baseball history. In 1971 that trio became a quartet as Pat Dobson joined the staff and they became the first team in more than 50 years to feature four 20-game winners. After winning 18 games during both the 1972 and 1973 seasons, Cuellar registered his fourth 20+ victory season in 1974 as he went 22-10 with a 3.11 ERA. That proved to be his final big season as Cuellar (at age 38) went 14-12 in 1975 and then struggled with a 4-13 record and 4.96 ERA in 1976. 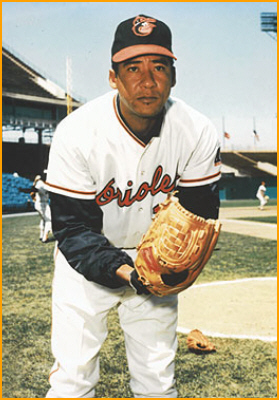 Released by the Orioles following the 1976 season, Cuellar signed with the California Angels. He allowed seven earned runs and pitched only 3.1 total innings for the Angles before being released in May 1977. Cuellar finished his career with a record of 185-130 and a 3.14 ERA. In eight years with the Orioles, Cuellar went 143-88 with a 3.18 ERA. He ranks fourth in Orioles history in wins and fifth in winning percentage. After retirement, Cuellar lived in Florida before passing away as a result of stomach cancer in April 2010.